BurnAware manages to perfect the balance between ease of use and range of features, and yet it is available completely free of charge. Rather than being fill with options and features which are rarely used, BurnAware focuses on the disc burning tasks which most users need most frequently. In just a few clicks of the mouse, it is possible to create a data, audio, MP3 or boot disc, create an ISO of an existing disc or burn a disc from an ISO file. The program supports not only recordable CDs and DVDs but also Blu-ray discs. BurnAware Free is the basic version which is ideal for burning a quick disc and is good enough for home users. 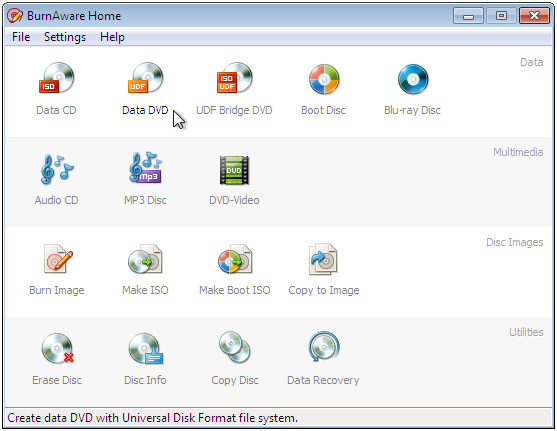 BurnAware Premium also offers disc copying, so you can easily make a direct 1:1 copy of an existing disc. You also get the ability to extract audio files from a CD and also recover files from scratched discs. Feature-packed and yet free, BurnAware Home provides all the tools you need to create a variety of different discs.